Row of stones under the South Mound excavated in 1941. Photo: the National Museum. As early as 1861 it was clear that large stones were located within the South Mound, but it was not until 1941 that an extensive excavation revealed that the stones stood in two rows. At that time the excavator Ejnar Dyggve interpreted the rows as two sides of a huge triangular holy area. However, there was some disagreement with this interpretation. A small excavation of the south side of the mound in 1992 indicated that the rows were if anything slightly curved; therefore the stone-setting was most likely in the shape of a huge ship. The idea had been put forward previously and was a possibility as stone ships were known from various other locations in Scandinavia. 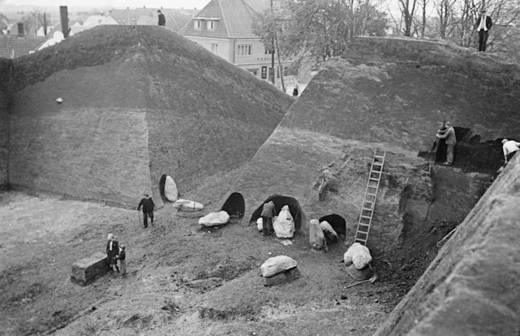 In 2006 Vejle Museum’s investigations to the north of the North Mound uncovered additional stones. The stones form a small triangle, perhaps the northern tip of an enormous ship-setting with an estimated length of 360 m, much longer than all other known Scandinavian ship-settings. The ship-setting is no longer visible in the landscape and over the years many stones are likely to have been re-used for other purposes. The project’s aim is to gather together and publish the scattered reports of large, menhir-type stones, which have been found in and around the churchyard in Jelling since the 1700s, and which may have originated from the large ship-setting. The publication will include an examination and assessment of all stone finds and supposed traces of stones, as well as information about stones which have since disappeared. The foundations for the various theories that have been put forward over the years to explain Jelling’s large stones will be examined, along with the basis for the dating of the stones and stone-setting. Finally the ship-setting at Jelling will be compared with contemporary stone-settings and ship-settings in the Scandinavian/Northern European area with the aim of an overall conclusion and interpretation. Detail of Ludvig F.A. Wimmer’s coat of arms. Photo: the Museum of National History at Frederiksborg Castle. Project coordinator: Museum Inspector Steen Wulff Andersen, Vejle Museum. Newly discovered stones north of the North Mound. Photo: Vejle Museum. 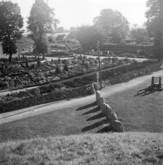 Row of stones erected after the excavations in Jelling in the 1940s to mark a supposed three-sided holy area, seen from the South Mound. Photo: Anne Pedersen. 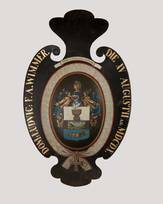 The coat of arms of the runologist and linguist Ludvig F.A. Wimmer (1839-1920). A stone-setting between the two mounds at Jelling is shown near the bottom. Photo: the Museum of National History at Frederiksborg Castle.